That happy dance moment when the project you've been working on for what feels like an eternity is finally, unequivocally, done. Done! First of all a glimpse at the goodies I got from my partner. Mainly lots of seed beads, some pearls, some very beautiful superduo`s in double shade, a lovely cab that Deborah has carved and polished herself, A beautiful dragonfly, a beach inspired trinket box and some pretty star fish inside. 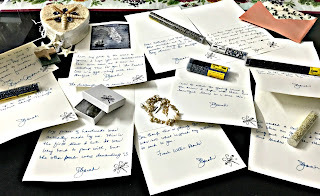 And loads of inspiring and encouraging notes, one with every article, handwritten, sealed and numbered and packed meticulously inside the box. Wow Deborah, you`ve amazed me and thrilled me with this gesture of yours. 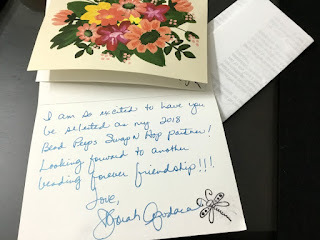 Can`t even describe the excitement I felt when I opened your each little surprise!! 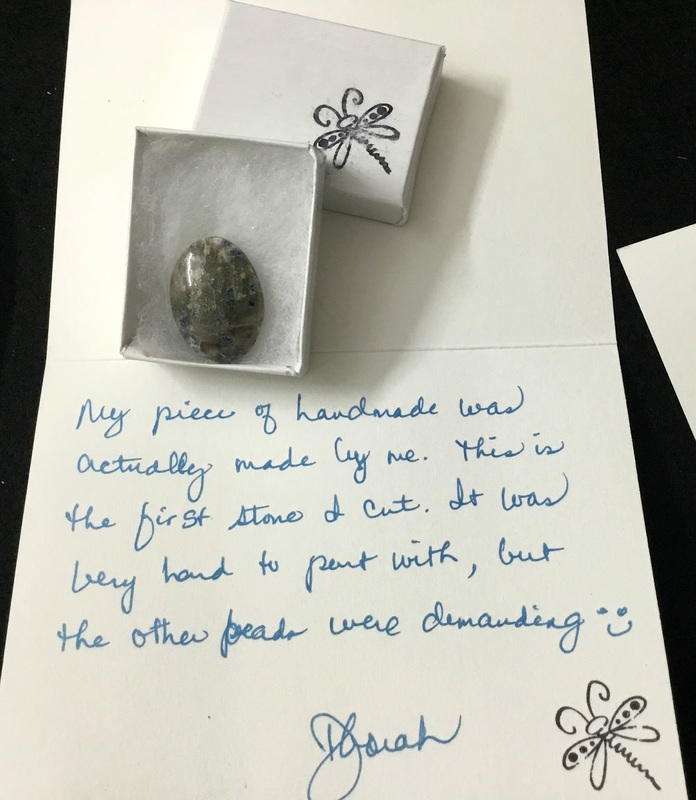 Deborah is very fond of Dragon flies, so each little item has been carefully wrapped and labeled with a cute little dragon fly, Wow! My dear Deborah - I can't thank you enough for being my partner and for sending me such exquisite goodies . 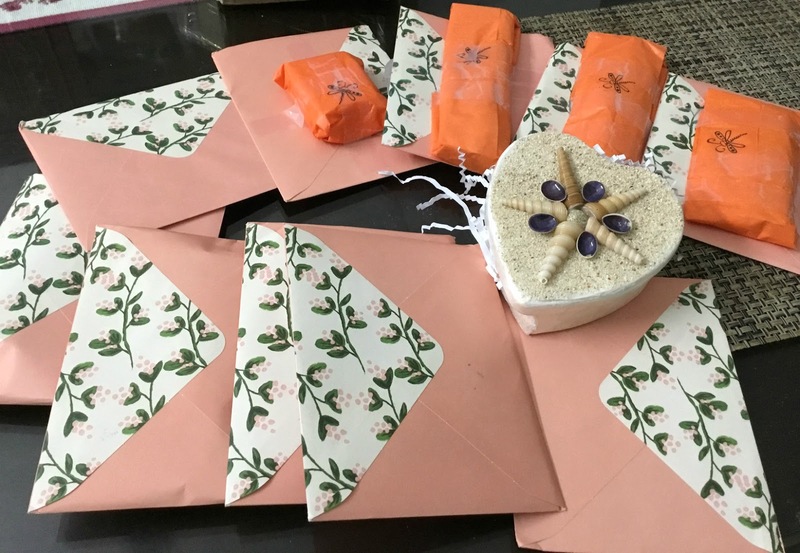 Have been awed by your meticulous packing, and the way in which you described each item you sent. The focal that you have carved and polished is so special to me, that I planned saving up for the last and create something spectacular with it. Absolutely beautiful cab! I never knew the work that went into creating one. I truly appreciate your generosity in parting with the first one you created . Thanks! My most favourite piece! I instantly fell in love with these Super Duo`s .AB polished and dual color, have never seen anything like these. 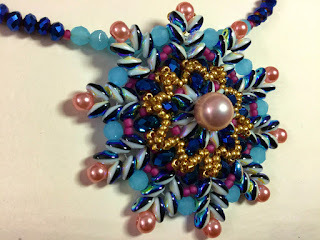 I can’t tell you how many times I reworked the pendant on this necklace. And I love the end result. 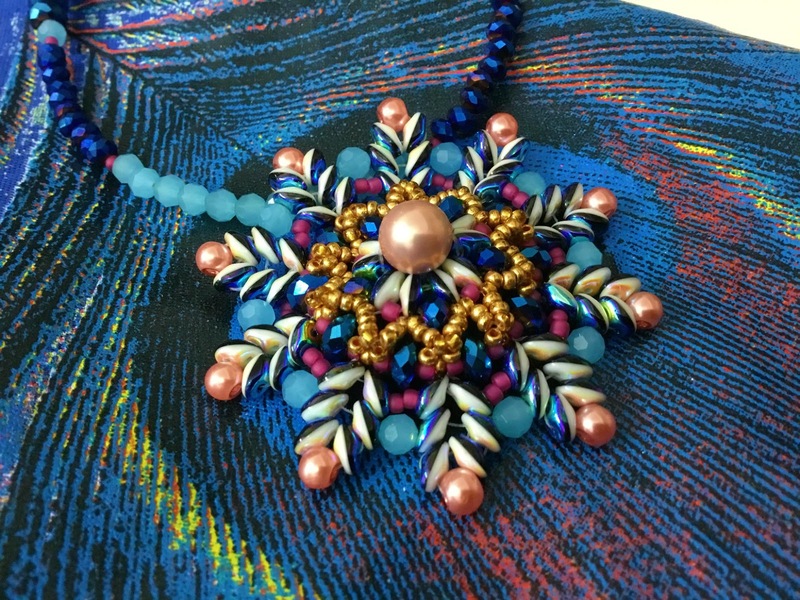 Reminds me of the traditional Indian enamel jewellery of Rajasthan. 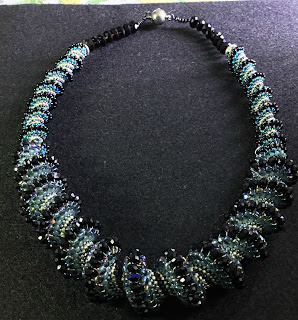 As soon as I saw the beautiful shades of blue and silver, I knew I wanted to make a necklace in cellini spiral. 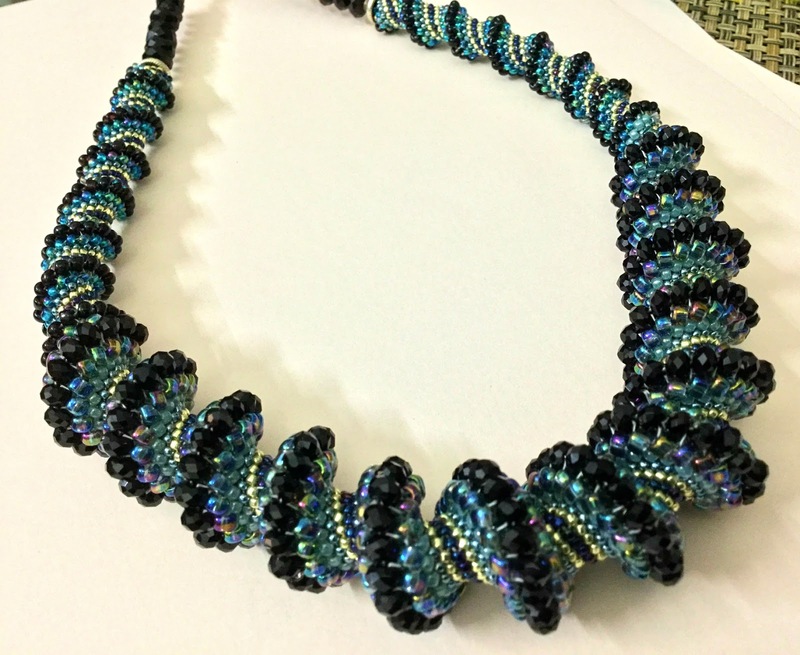 Always wanted one but never could find the right beads. Either the sizes were not what I required, or the shades all wrong. But these beads were perfect. And the triangle beads are just super, waiting to be flaunted. So I created this necklacein graduating thickness . 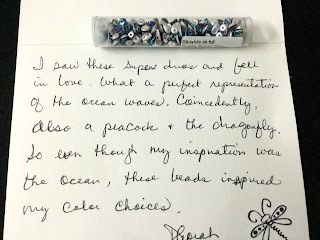 Tried to click a picture of the beautiful luster and the iridescence these beads have but don`t know if I have captured it all. 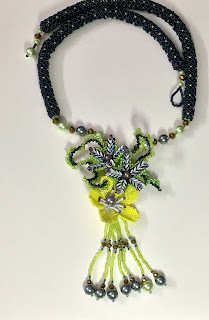 After many tries I created the focal in netted Super Duo flowers with embellishments of creepers in green and blue . Never made one before so took me a while to get it the way I wanted. 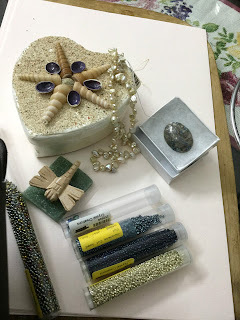 … I knew from the beginning that I wanted to bring out the lovely tones in these beads and I wanted to enhance the each bead type and complement it, so I added some beads from my own stash I also added tiny glass pearls and some light green Swavroski pearls - some shiny and some with a matte finish for visual interest. Netting the chain however was quick. What do you do with star fish? ? Again a first time for me . After much thought, I finally came up with the idea of using the seed bead tube of variegated colors and add starfish as a focal. Once I got working on the design I planned, I realized that bead embroidery with shibori ribbon would take a long time so decided to weave the necklace instead. Wanted to add some silk, but now that I have finished I think it looks lovely as is. Enjoy the lovelies everyone has made ! 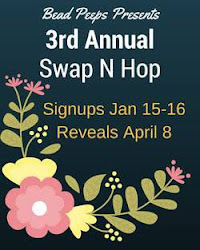 Thank you for hosting this great blog hop Linda. I have really enjoyed it! And got to learn so much too !! It's no secret that seed bead work mystifies me. And your creations are a perfect example of why - it's magical! To take tiny pieces of glass and thread and weave them into these masterpieces is AMAZING! I adore everything you created. They are all so very beautiful! Thanks Divya. The second necklace is my favourite too. Gave me a few bad moments though, as the thread kept snapping after every few turns with the weight . Also had to change some of the beads towards the end as I ran out of a couple of shades. But finally it did turn out as I wanted. And yes, as you say the first one does look like the temple mandala, but my inspiration was actually the blue " jadau" of Jaipur. And the yellow flower necklace is infact a long one almost 30" . 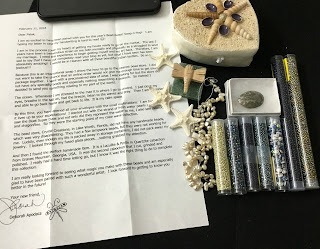 The beads Deborah sent were so even and beautiful, that I used the entire tube to make the chain. Incredible! 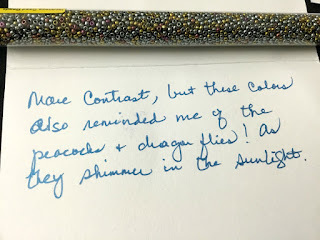 Such stunning designs you've created! 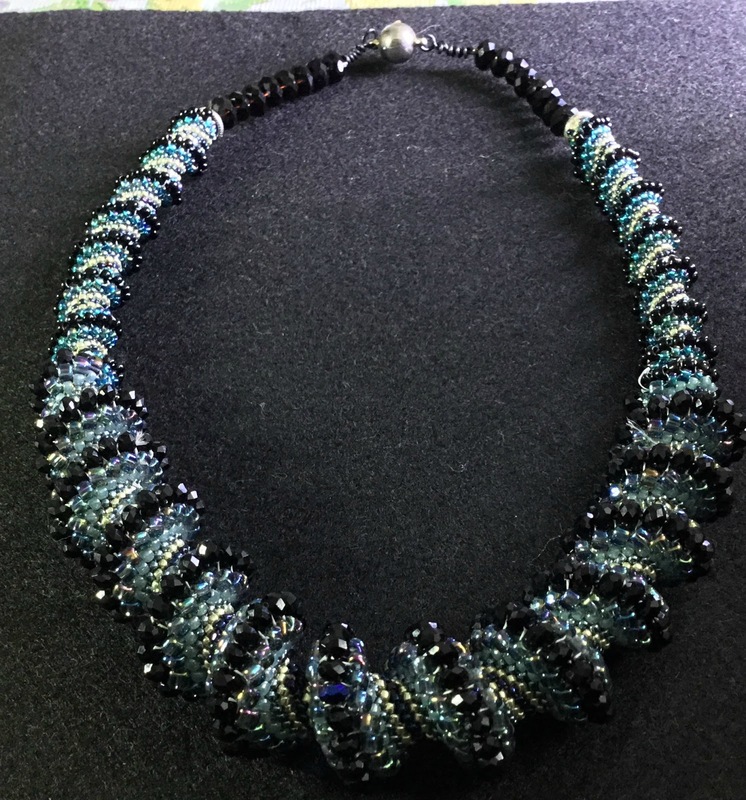 I am in such awe of those who do bead weaving and yours has just taken my awe to a whole new level. Beautiful, beautiful work! You made such a really lovely necklaces. 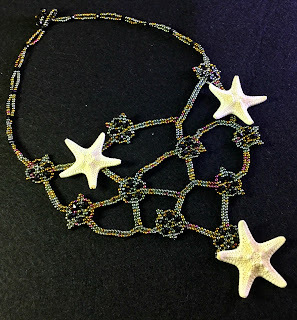 My favorite is the star fish necklace. 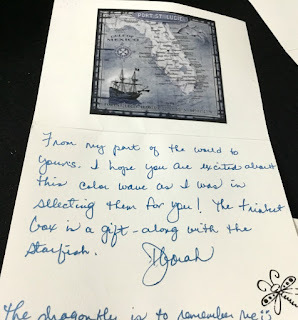 I like the style, colors, and especially the starfish . Thank you so much. 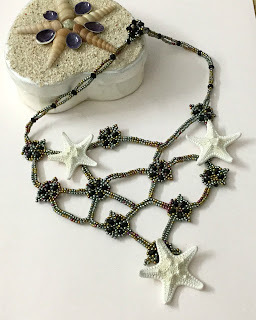 The starfish are so pretty, and variegated colors of beads matched well with them, so it just clicked. Spectacular! 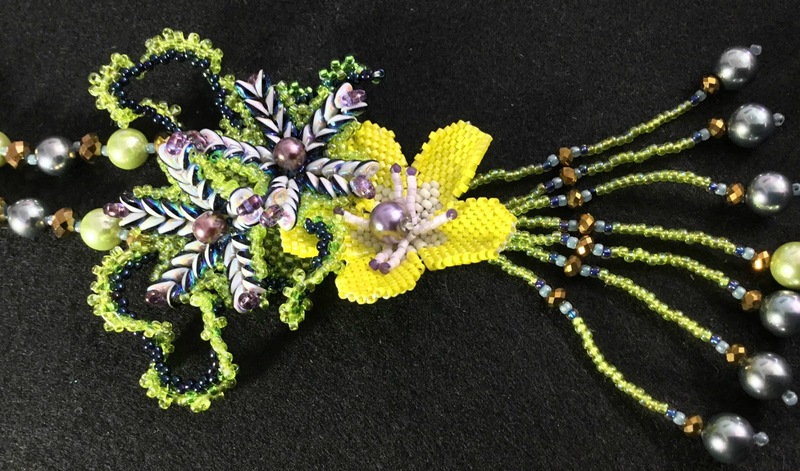 Seed beading amazes me as I have no patience for this detailed work. Lovely, lovely work! Hi Palak, You created four wonderful necklaces and you don't seem to think that you did enough. 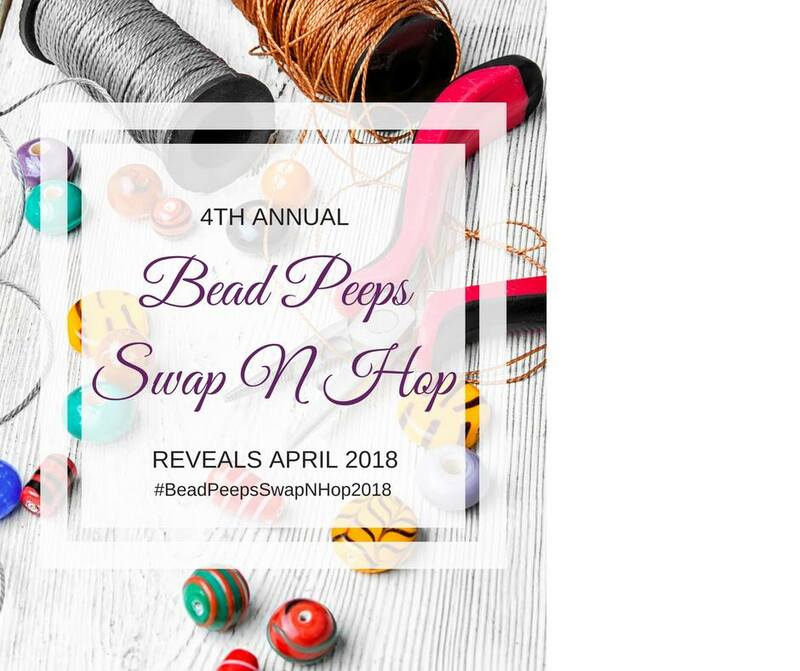 You did a great job using your swap beads. 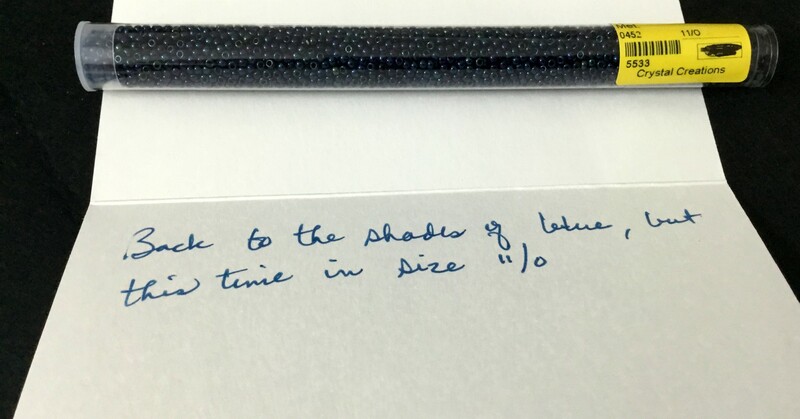 Kudos for doing new techniques so well. The first pendant is absolutely stunning. OMG!!! Those are Amazing designs!!! Beautiful Job! Be Blessed! 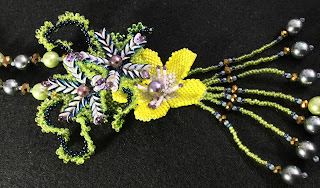 Your beaded flowers are just amazing and you have made some stunning designs. 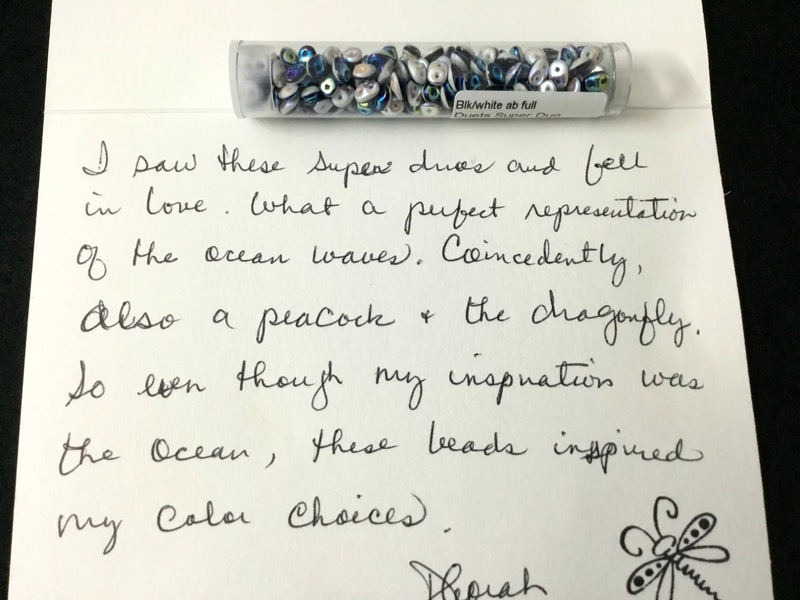 I have always admired seed beaders for their persistence and imagination and your work is no exception! I love them all but the star fish necklace impressed me most! WOW. Such beautiful pieces. Great job! Palak - I'm speechless. 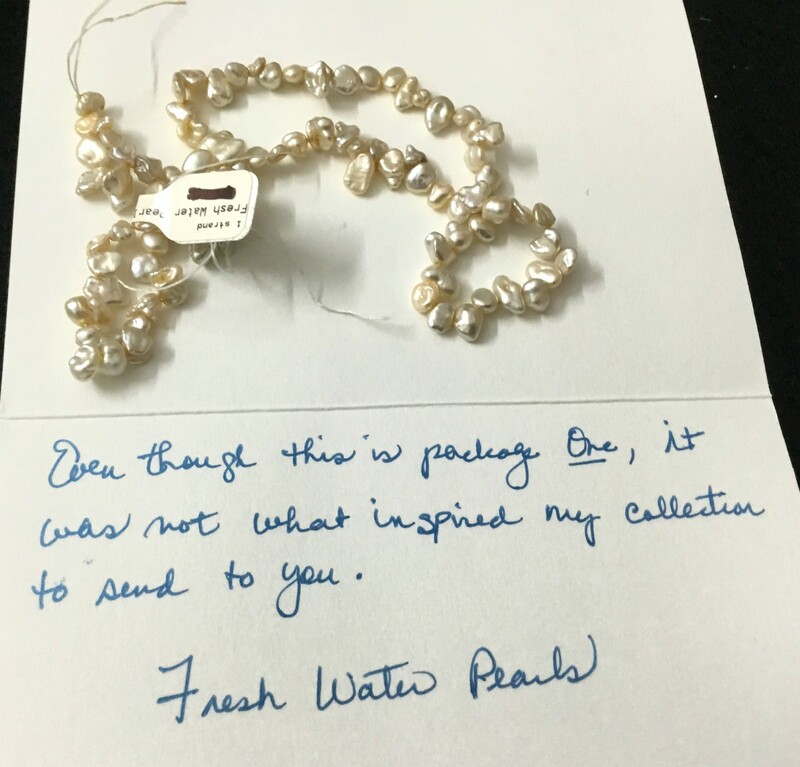 Your pieces are absolutely EXQUISITE! Each one is more beautiful than the next.... 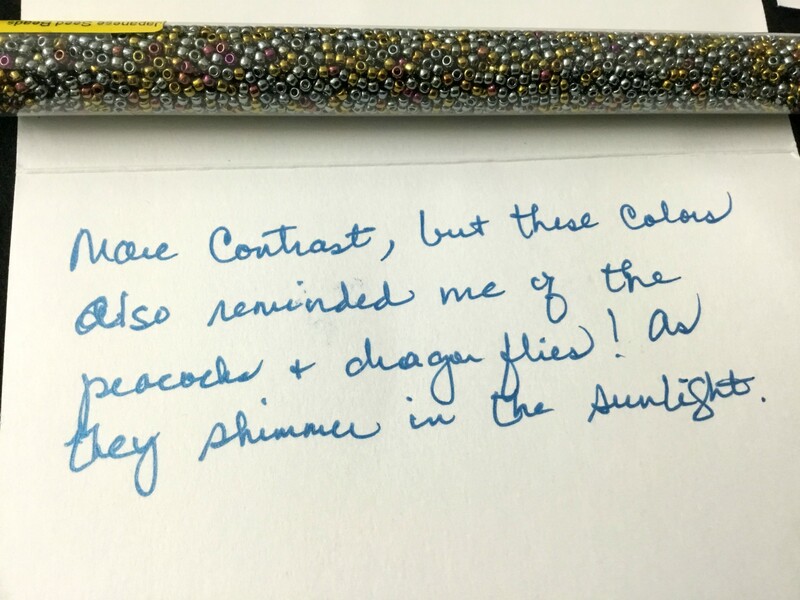 I'd say my favorite is the Cellini spiral.... but then the yellow piece....and the starfish... I'm just BLOWN AWAY! BEAUTIFUL work! Congratulations!